We sure are eager to flip that treasure. Let's see how the dickering goes! 45 goods. That's still a loss, though not a particularly bad one. Here's much worse news. We have 445 bushels of food as of right now. Each bushel is enough to feed one person for a year, and we have 785 mouths to feed. 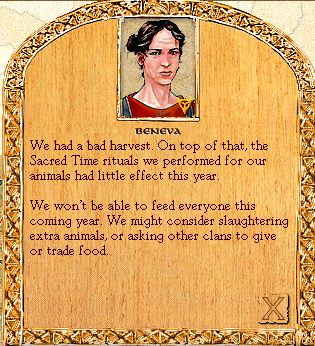 We won't be getting much more until next earth season, so we'll have to follow Beneva's suggestions if we don't want to starve. But we can't reliably do any trading right now, because it's Dark Season. The weather is cold, snowy, and generally terrible, and even attempting to leave the tula has a high risk of failure. All of that makes Dark an ideal time to sacrifice to the gods. 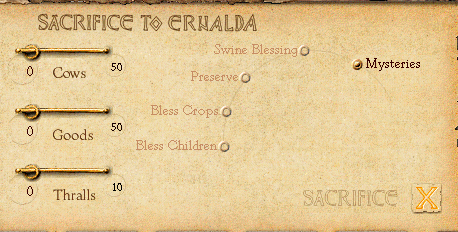 It's too late to do anything about this years harvest, but hopefully by learning one of Ernalda's blessings, we can improve our food situation in future years. 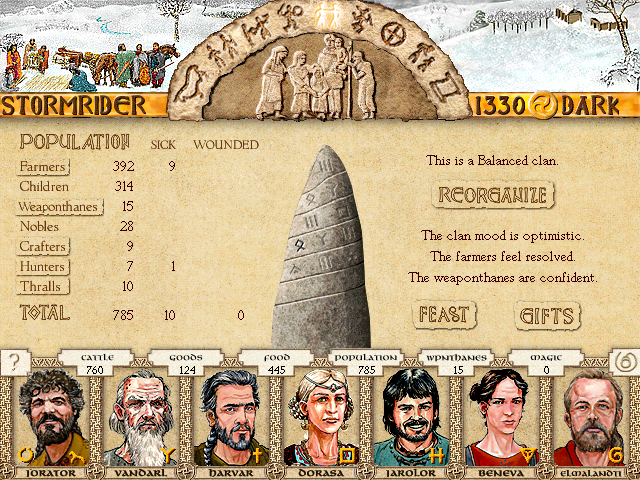 Here's the sacrifice screen. 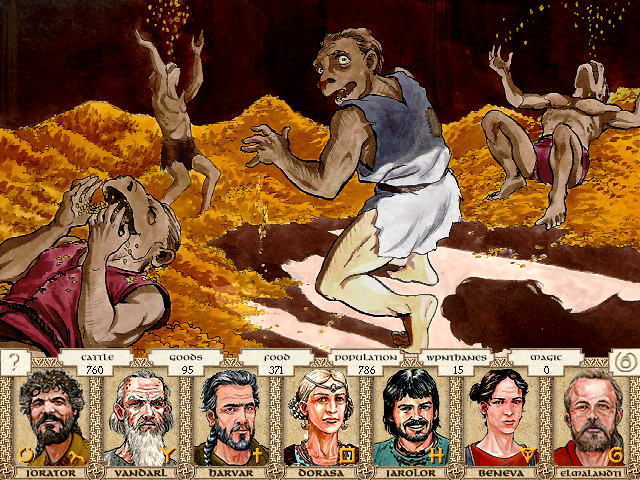 It's possible to sacrifice goods, cows, and/or thralls. 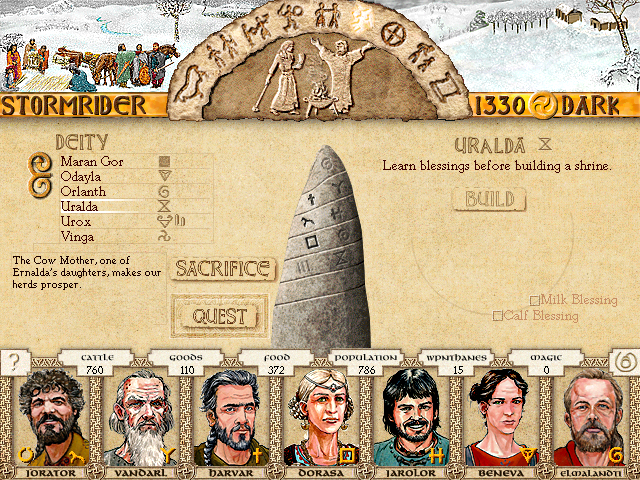 Peaceful gods like Ernalda prefer sacrifices of goods; warlike gods such as Orlanth prefer cows and thralls. 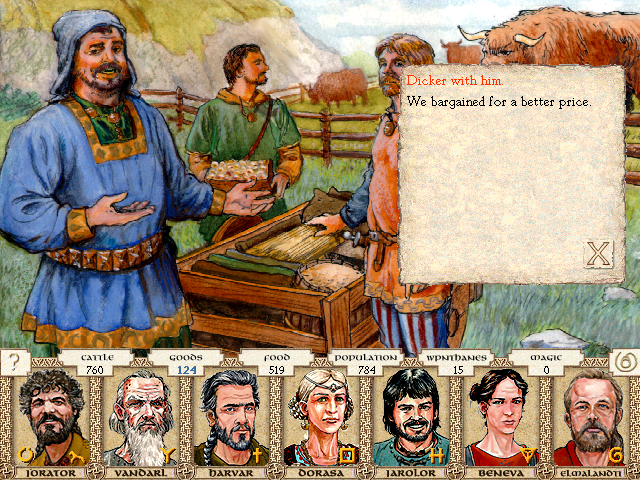 7 cows(/goods/thralls) is a minimum sacrifice if you want a remotely decent chance of success, but I usually sacrifice 14. What blessing will Ernalda give us in exchange for 14 goods? That's...kind of helpful, actually. When performing the Ernalda Feeds the Tribe heroquest, one of the potential rewards is to increase crop yields. Of course, the risk involved is much greater than simply sacrificing for or building a shrine to get a blessing such as Bless Crops, but the rewards are greater as well. The updated myth is here. No events happened after that, so I decided to go after some more mysteries. Both of Uralda's blessings are excellent - Calf Blessing is usually more helpful because it increases the fertility of our cows, but Milk Blessing would also be helpful for us now, since it allows our cows to produce more milk(which acts as food for the clan). You may have noticed by now that the soundtrack doesn't have the most creative song titles in the world. Still great music, though. Swen finds a bunch of small trolls rooting around the grain bins of his stead. They've eaten some of the grain, and have ruined more of it. You're familiar with these creatures from the old country - they're trollkin, the stunted and sometimes simple-minded offspring that most trolls are cursed with. The trolls mistreat trollkin, and will hardly care what we do to these ones. If we don't kill them now, they'll be trouble later. Of all the gods, only Eurmal would be pleased by a gift of trollkin. They might be able to perform simple but unpleasant chores.